I became an admirer of New Orleans writer and interior designer Rosemary James about twenty years ago after reading an article in Southern Accents in which she described our city’s overriding decorating style as “Swamp Palazzo.” In my opinion, this summed up in two words all that New Orleans style entails. In fact,the title of my blog, Bayou Contessa is a nod to this term. Although the article was written twenty years ago, it is absolutely as right on today as it was then. 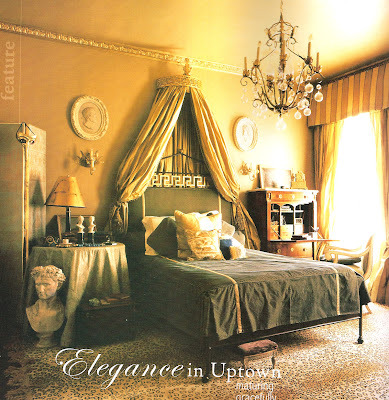 Could it be that New Orleans’ Swamp Palazzo style is the ultimate in timelessness? For Rosemary James, New Orleans style, or “Swamp Palazzo” is one of exaggerated elegance, in which southern formality is tempered by life in this tropical climate. It’s a style which is both theatrical and relaxed, which boasts of simple curtains with unusual details, antique textiles joined with new fabrics on a single piece of furniture, and aged unstained cypress floors conditioned with natural beeswax. 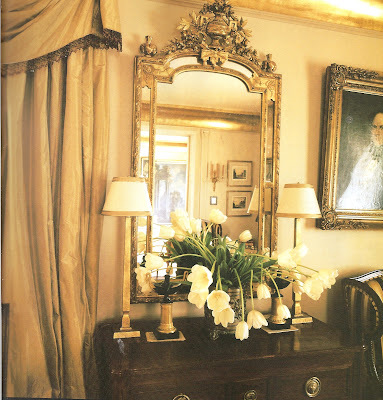 Nowhere is this style more apparent than in the home of Dr. Quinn Peeper, for whom Ms. James was the designer. This is the third project she has done for Dr. Peeper and it’s featured in this month’s issue of Louisiana Homes and Gardens. In James's opinion, "New Orlenians are event-motivated. They arrange their lives around the plentiful, important social gatherings of calendars for both Carnival and cafe society. They live to be entertained and to entertain." 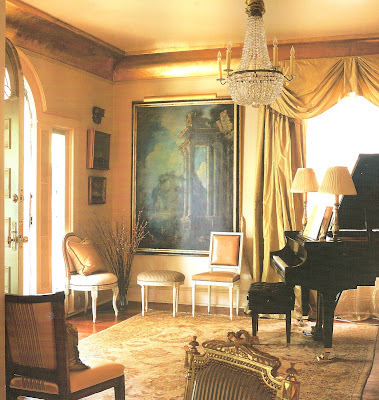 The entry foyer of Dr. Peeper's home is filled with french antiques and a grand piano. One of New Orleans' celebrated citizens, Dr. Peeper is both a physician and a concert pianist who will be performing at Carnegie Hall in March. Dr. Peeper's new house is a 1903 mansion believed to have been designed by the famous New Orleans architect Thomas Sully. The dining room evidences the Swamp Palazzo tendency toward luxurious texture and hints of bronze within a monochromatic color scheme. The gilded crown molding and antique coastal landscape paintings add to the timeless appeal of this room. "When the house is lit for a dinner party, the gold leaf gives everything a warm glow," says Peeper. In Swamp Palazzo style, "custom furniture, art, or accessories that give a quaint bow to the past are always attractive to New Orlenians." Rosemary James had Peeper's bed made from an iron fence and added the corona for height. 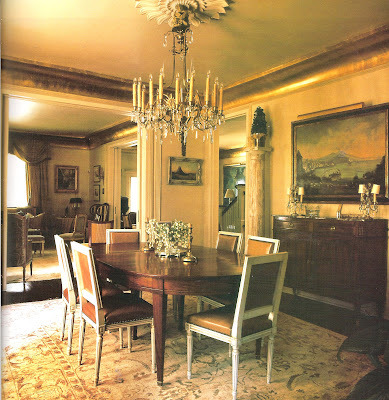 She also created the chandelier using 24-karat gold flecks in the blown glass crystals. 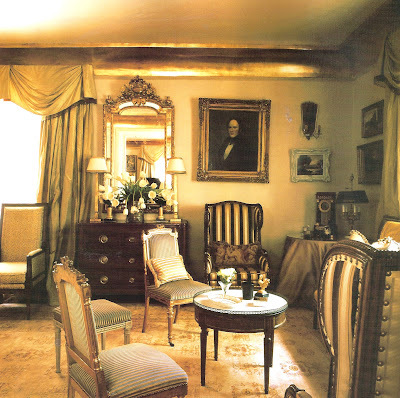 The elegant use of gilded details in this room makes me weak in the knees. 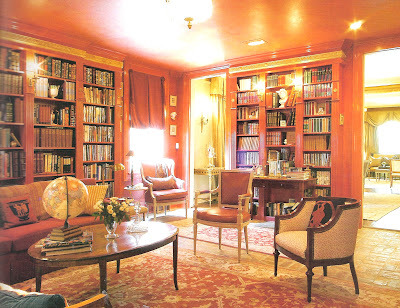 The library is a celebration of the color red, and the Greek key pattern which was used to great effect in the Master Bedroom is repeated along the tops of the bookcases. Elaborate ornamentation and saturated color are two important facets of the Swamp Palazzo style and give this room its over-the-top elegance. Notice the wonderful Greek vase inspired pillows. According to Rosemary James, "The final touch is the arrangement of this furniture, which provides grand entrance and exit possibilities as well as excellent seating and standing positions from which the actors in this living theater can deliver their bon mots with ease. In New Orleans, our rooms must be places where seasoned thespians can practice the art of reinvention for ever-facinated audiences." It is so fascinating to me that the words Rosemary James used twenty years ago to describe our wonderful New Orleans style still hold up today. And the exquisite interior design that she and Quinn Peeper created for this house show that the Swamp Palazzo style continues to flourish.